Author: McDonald, Gregory Set In . . . Description: When Boston Police Inspector Francis Xavier Flynn’s barely adolescent daughter asks him to rescue her friend Billy from the cemetery, where he’s been fastened to a tree by a nail through his earlobe, the good inspector is pretty sure there’s something more behind what at first seems like a bully’s prank. And he’s convinced there is more than mischief involved in the hateful threats against distinguished Harvard professor Louis Loveson. If that weren’t enough to keep Flynn busy, there’s Lieutenant John Kurt, whose very impressive arrest record follows some very disturbing patterns. 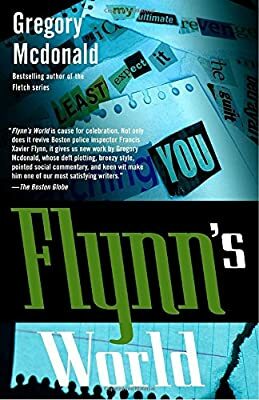 In Flynn’s World, two-time Edgar Award-winner Gregory Mcdonald’s dogged detective confronts intolerance in all its guises, and sheds light on more than one dark secret. F.X. Flynn made his first appearance in Confess, Fletch, where he matched wits with the inimitable Irwin Fletcher. Since then he has befuddled, bemused, amazed, and infuriated his colleagues on the Boston Police force as he has pursued international terrorists, blackmailers, murderers, embezzlers, politicians, and, occasionally, his fellow policemen—all while doing his regular job.